THE STAN KENTON LEGACY ORCHESTRA Celebrates FRANK SINATRA'S 100th Birthday starring DAKOTA HORVATH featuring Scott Whitfield & Ginger Berglund as "Steve & Eydie!" Frank Sinatra's birthday is 12/12/15. This show can be presented anytime in 2015. MIKE VAX: Leader, was Road Manager with Stan Kenton's original Big Band & First Trumpet. GINGER BRGLUND & SCOTT WHITFIELD are likened to Steve Lawrence & Eydie Gorme in this show. 13 of the KENTON ORCHESTRA played with the original STAN KENTON BIG BAND. WHY BOOK THE KENTON ORCHESTRA? BOTH STAN KENTON & DAKOTA HAD A RELATIONSHIP WITH FRANK SINATRA. - STAN KENTON helped get Sinatra signed to Capitol Records when Sinatra's career was wavering for which Sinatra was eternally grateful to Stan. They became great friends. Sinatra narrated "Biographies: The Kenton Era Part I and II," which is a wonderful accounting of Stan Kenton & can be seen on youtube. to tribute Sinatra to this day. Dakota just wrapped a one-year run in Vegas, 5 nights a week, 2 shows a night performing as Sinatra in a Rat Pack show at The Four Queens. At the age of 5, Dakota gave birth to his career tributing Sinatra at Mickey Rourke’s club in Miami. 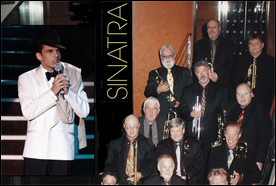 At the age of 12 Dakota began his earliest Las Vegas Sinatra performances in “Legends in Concert” coupled with many live appearances on “The Dennis Bono Show” with host, Bobby Rosario. At 15, Dakota sang for Brad Pitt and Jennifer Aniston’s wedding, opened for Natalie Cole and performed at The Sopranos’ Emmy Awards party in LA as Frank Sinatra. Dakota has been a 'Sinatra' celebrity guest on Regis Philbin, Diane Sawyer, Jerry Springer, Phil Donohue, Jenny Jones, Fox in the Morning, Good Morning America and Rick Kogan. Dakota's tribute shows to Sinatra have made the news in US Weekly, London Mirror, Chicago Sun-Times, Chicago Tribune, The NY Times and The LA Times, WGN Radio in Chicago and KJAZZ Radio in Los Angeles. Dakota has shared the stage with such celebrities as Tony Bennett, Jimmy Buffet, Herbie Hancock, Seal, Rick Springfield, Clint Holmes, Don Rickles, Dennis Tufano, Melissa Etheridge, Lou Rawls, Paul Anka, Michael Bolton, Tony Orlando and Pia Zadora. His list of clients are many including The City of Hope, Boys Town, Coach for Kids, Sketchers and the Chicago Bulls. Dakota sings “That’s Life” in James Quattrochi’s film, “At The Sinatra Club” for Tri Coast Pictures. Dakot's most recent CD features the virtuosity of the Jazz great, Benny Green, on piano and is a compilation of Frank Sinatra classics and Original songs. Frank Sinatra was not Dakota’s only singing influence. He grew up listening to Carmen McRae, Billie Holiday, Ella Fitzgerald, Sting, Barbra Streisand, Stevie Wonder, Bobby Darin and Gino Vanelli. Now 27, Dakota has emerged with his own vocal styling…mixing it up and appealing to audiences of all ages. In 2012 Dakota played The South Point Casino in Las Vegas, “A Tribute to Bobby Darin,” singing the original charts of Bobby Darin with a 14 piece Big Band featuring the Fat City Horns from the mega-watt band "Santa Fe" in Las Vegas.